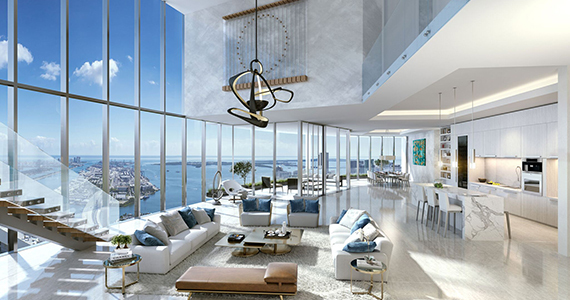 Paramount Miami Worldcenter unveiled its Penthouse Collection Series, which is comprised of 26 residences ranging in price from $3.5 million to $9.5 million. Eight of the standout units will be two-story duplexes and all penthouses will be housed in the upper core of the 60-story tower, the sole residential building currently for sale in the massive mixed-use development encompassing 27 acres in downtown Miami. The residences feature four or five bedrooms, ranging in size from 3,500 to over 6,000 square feet. Among the apex units are two duplexes on the 54th floor and two others on the 55th and 57th floors. Those four levels represent the “Skydeck,” which is designed “to look like the helm of a magnificent Italian super yacht,” per the release, featuring its own sky lounge, multiple pools, observatory, sundeck and Tai Chi deck. Other details of the collection include private elevator access; chef kitchens with 12-foot islands and Gaggenau appliances; 10-foot ceilings throughout; and expansive outdoor living rooms. The lavish, amenity-rich condo is on track for completion in early 2019, injecting another 500-plus units into Miami’s core. 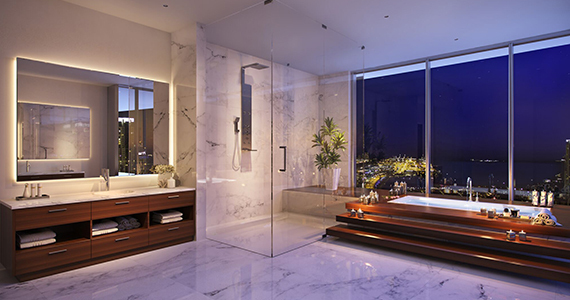 Renderings of the penthouse collection are below.